In the wake of the horrible event that took place in Virginia last weekend, I was reminded of a couple of things. #1 Sometimes people can be atrocious maggots, and I’m speaking of the one guy who drove his car into the crowd. And #2 How much I love the police department here in Nashville. In my experience, they’ve been nothing but top-notch, literally the guardians of the city. One story I can share happened a few months back on a Thursday I went downtown to watch the Predators play in the Stanley Cup finals. I’ll admit I was a bit nervous because the crowds there were so big. Someone might have seen it as a perfect opportunity to inflict harm on people. But I decided to go anyway, so I met up with a friend a couple miles from downtown. We walked from Centennial Park all the way down Broadway to set up our camping chairs at one of three giant screens they erected for fans to watch. As we neared the organized chaos of that night (CMA Fest was also happening at the same time) and saw thousands of people scattered throughout the downtown streets, we also noticed something else. Those are a dump trucks. Those are giant dump trucks lined up back to back. This was at the intersection of Broadway and maybe 10th or 11th Avenue. From there down the rest of Broadway was all blocked from vehicle traffic and these giant blockades would prevent any sort of “terrorist” from driving anything smaller than a tank into the crowds that night, and the entire weekend. It made me so proud. SO PROUD. Our police department, and city officials, plus CMA and Predators folks as well, were thinking ahead and planning in ways I never thought of to protect me and everyone else who just wanted to have a fun, safe night. I know this is just one example and I’m sure there are plenty of other stories about the police here. We’ll never know what possible barbaric acts were prevented the nights Nashville hosted the Stanley Cup finals and the CMA fest on the very same nights. But my memory from those nights will be how Metro Police officers were our guardians. That time I thought my dad was gonna freak out! I’ve been nervous around my dad many times. And for all sorts of reasons but as a youngster it was mostly because I had done something wrong and punishment was coming down, sooner or later. Or other times growing up like when he was teaching me and my brother and sisters to water ski or basically teaching us to do anything near the water. That was his domain, hey he was in the Coast Guard for 27 years! If we couldn’t get it, we were sent to the poop deck! As a young adult it was less about discipline coming from the former Coast Guard captain, and more about what he might say in front of friends about his single sons! “Any single girls out there… with insurance? ?” he would say. This post is about back when I was in middle school in Stafford, Virginia. The years we lived there we attended Mount Ararat Baptist Church pastored by Dee Williams. We were faithful churchgoers on Sunday mornings, Sunday evenings, and Wednesday nights, too. My brother, who was year and a half older than me back then, and I had a lot of the same friends, and one was Daniel. Daniel was out riding his bike one day. I think it was some kind of bicycle ride fundraiser thing. He had a 10-speed so the tires were really skinny. Well, partly because of that, when Daniel’s front tire hit a rock, Daniel went over the handlebars. It was bad. He hit the pavement face first and was rushed to the hospital. He had to have surgery, stitches, all that, but I don’t remember the exact extent of his injuries, except that it was bad. So the first weekend that Daniel was back home, my brother and I wanted to visit him. He lived across the street from the church. Sunday we all spilled out of the van but instead of going to Sunday School like we were supposed to, my brother and I went over to see Daniel. Well, long story short, we ended up hanging out with him and missing church completely! “What, you don’t love God anymore!?? ?” our dad would challenge. “You’re terrible people.” he would say. “Wash the van with your tears and a small rag! !” he would demand. But it wasn’t like that at all. In fact, it was so much the opposite. Our dad was actually proud of us. The day went on as a usual Sunday but I won’t ever forget the surprise of that day. I was expecting a fatherly fallout, a patriarchal poop deck punishment, a dad discipline to match the offense of missing a church service. Instead it was a pat on the back. He asked how Daniel was doing. He knew something I didn’t know way back then: relationships trump ritual every day of the week. My dad is full of surprises. God is more interested in relationships than rituals. Thank you Dad, and happy Father’s Day from your slightly more favorite son! There are scenarios where having your tongue out is a good thing. For instance, when it’s snowing and you want to catch the snowflakes. Or if you’re Jordan. Or when the doctor uses that wood stick to “get a closer look.” So can you blame Miley Cyrus for letting her tongue hang out like a labrador? Yes, yes you can. But as silly as she is, I’m a victim of the same exact habit. Stafford, Virginia. It was my 5th grade year and I noticed I had a habit of sticking my tongue out when I was concentrating. Not knowing how to resolve this, I enlisted my friend Robin’s help. 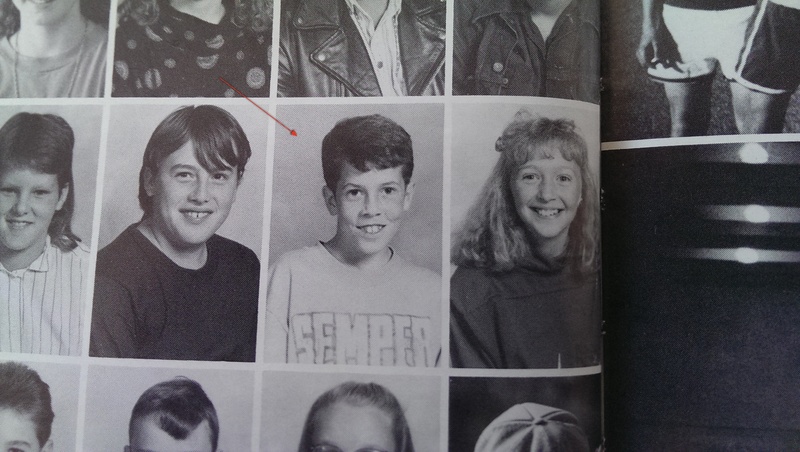 me in 5th grade sporting a Semper Paratus shirt, next to Whitney Williams. I said, “Every time you see me with my tongue out, laugh.” I was sure when I heard Robin laughing at me, I’d know why and it would trigger a positive response. Let’s just say she laughed a lot. In hindsight, I should’ve expanded the team of helpful volunteers to more friends. Like JR, Chris, Meghan (who I still owe $5,000), Michelle, Joey, Whitney, Heather (who I loved? ), Carson, and Lisa. All that laughing surely would’ve helped! But I guess if Aristotle is right, that “we are what we repeatedly do,” then I’ll always be exactly like Jordan, in every way, especially basketball. A few nights ago I comically confessed to my parents, and other family together for the holidays, that my brother and I used to have cussing sprees on the golf course behind our house in Aquia Harbor. Oh, and he wasn’t present when I spilled the secret but I assumed he wouldn’t mind. Sorry if this throws a wrench in your style, bro! It’s not that there wasn’t anything else to do in Stafford, Virginia. I guess we were going through some sort of rebellious phase even at the young age of early high school (my brother) and middle school (me). I can’t remember what compelled us to start using profanity, but we’d leave the house, walk up the hill and through the small amount of woods separating us from the 4th hole tee, and let the foul words rip. So now I’m a taddle tail. Sue me. It’s not as if my parents could ground me. “I’m a grown man!” I don’t think they’d ground my brother either. The most trouble he can get in is explaining this to his church! Yes, he’s a pastor. But if anyone in his congregation is reading this, cut him some slack! He was a young whipper-snapper just trying to navigate high school life while trying to be as cool as his younger, middle school brother. Or so I assume. At some point we grew tired of our trips outside so we stopped. At this point in the story one of my sister interjects, “Was the only reason you stopped because we moved?” How dare she! But maybe. Either way, we turned from our evil ways and became wholesome again. It might have had something to do with the time I said the ‘s’ word in front of my dad. He was reading the newspaper while my brother and I were talking nearby. Somehow the curse word slipped out and I immediately jerked my head towards my dad, assuming he was going to ground me for life. He didn’t flinch at all. Are parents really able to tune children out that well? Amazing. And I was thankful for it that day. 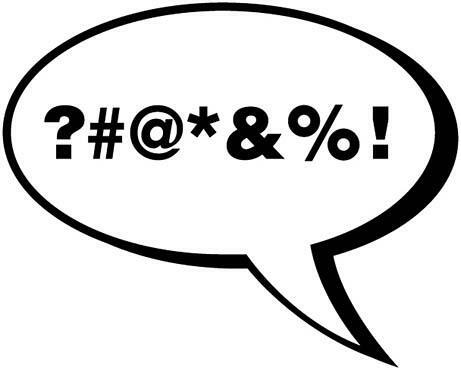 I’m all grown up and can now say cuss words are more relevant to me, only because I know when they are appropriate to use. On the golf course as a middle schooler was completely out of context (because I wasn’t actually playing golf, anyway). But am I the only one that thinks in the right scenario, certain words just work better? And by “right scenario” I mean “in traffic with bad drivers,” and more specifically, drivers in the south. Some things I just won’t ever forget. One is that I owe this junior high girl $5,000. Well, she was a junior high girl. And I was just a kid walking around in my Starter jacket hoping to get braces one day soon. I’m not sure what the money was for, if she still remembers, or what inflation hikes the rate up to now… 24 years later. It’s funny though. You know how when you’re little everything seems bigger? Like the house you grew up in. If you saw it now, it would look small. This debt doesn’t seem any smaller now that I’m all grown up! $5,000 is a hefty chunk of change whether I’m a 12-year-old in Stafford, Virginia or a grown man in Tennessee. Let’s just hope she forgot, same with that girl I made cry. Man, I sure had a way with the ladies. I make one cry and owe another thousands. Maybe I can sell my Dan Marino rookie card I scored for $23 from Chris back in ’89. It’s gotta be worth more now. Hopefully around $5,003.49. $5,000 for the one friend, and a $3.49 box of Kleenex for the other. I was at work the other day and someone came up and said, “How ya been, Ben? Shot a rooster and killed a hen.” Now, he’s from Cracker’s Neck, Virginia so he knows just about every country phrase there is. Sometimes when I email him, I need Google to help me come up with a phrase that he’ll appreciate, because I don’t know nearly enough to hang with him. When he said the rooster line, it reminded me that my grandma said it to me all the time growing up. It’s a good memory and I’m glad I heard it again today. I love the South. I could never actually shoot a rooster, or kill a hen.